More than an eon ago, the sun shone dimmer than it does today, but the Earth stayed warm due to a strong greenhouse gas effect, geoscience theory holds. Astronomer Carl Sagan coined this “the Faint Young Sun Paradox,” and for decades, researchers have searched for the right balance of atmospheric gases that could have kept early Earth cozy. Biological markers responsible for extreme exhaustion in patients with cancer have now been linked to fatigue in those with Parkinson’s disease, according to new research from Rice University. 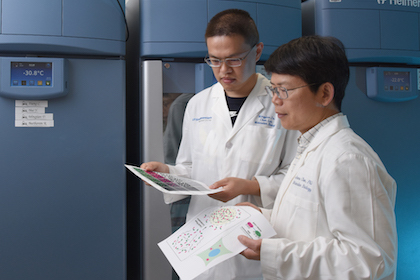 Using a new computational strategy, researchers at UT Southwestern Medical Center have identified 29 genetic changes that can contribute to rhabdomyosarcoma, an aggressive childhood cancer. The group used Bayesian analysis, a method for statistical inference, in conjunction with screening using CRISPR/Cas9, the much-heralded gene-editing tool, to confirm the statistical predictions. Want to be a supercentenarian? The chances of reaching the ripe old age of 110 are within reach – if you survive the perilous 90s and make it to 105 when death rates level out, according to a study of extremely old Italians led by UC Berkeley and Sapienza University of Rome.